The OSU Geo Club and Hydrophiles are spending their spring break in Israel and Palestine. They’ve started a blog which will be updated nightly during their visit. Check it out and enjoy the narrative and photos! 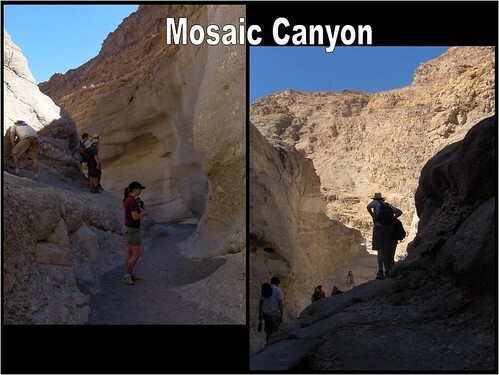 Mosaic Canyon. The river (apparently very ephemeral) has plastered layers of breccia onto the sides of this canyon, creating an amazing effect. 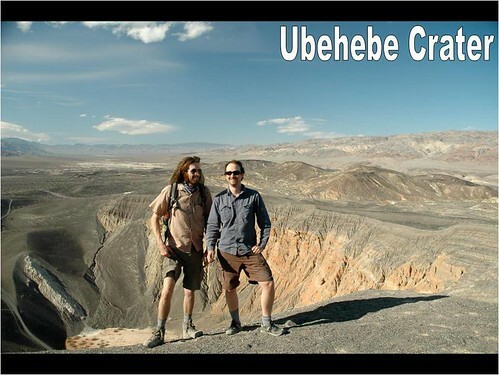 Barry Walker and Morgan Salisbury in front of Ubehebe Crater, a ~600 ft deep explosion crater in the northern part of the park. A few thousand years ago (estimates differ from 6,000 to 2,000), magma reached the near surface here, boiling the ground water and, as a result, creating several explosion pits, of which Ubehebe Crater is the largest. 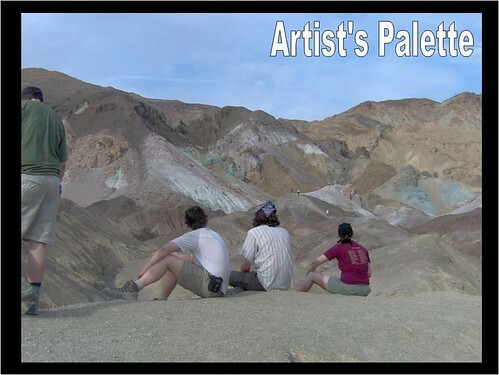 Minor copper mineralization in these hills has caused the distinct coloration of Artist's Palette. 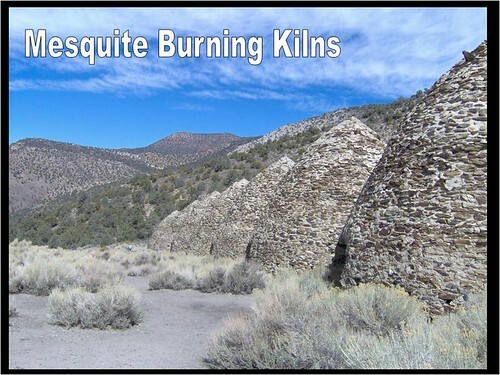 Kilns (built originally in 1867, restored in 1971) used to slow-burn wood down to charcoal. The charcoal was then used for smelting and ore extraction in the many mines of Death Valley. Sara Alsbury and Lauren Foiles use the ol' "teamwork" method for rock identification. 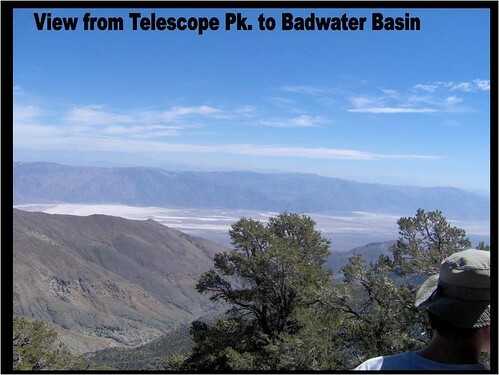 On the last day, the group hiked partially up Telescope Peak, which is the mountain just to the west of Death Valley and Badwater Basin. 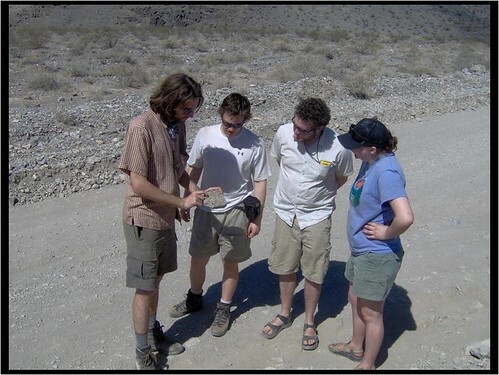 Geologists Barry Walker, Russell Rosenberg, Luc Farmer and Lauren Foiles. This is possibly a staged photograph. 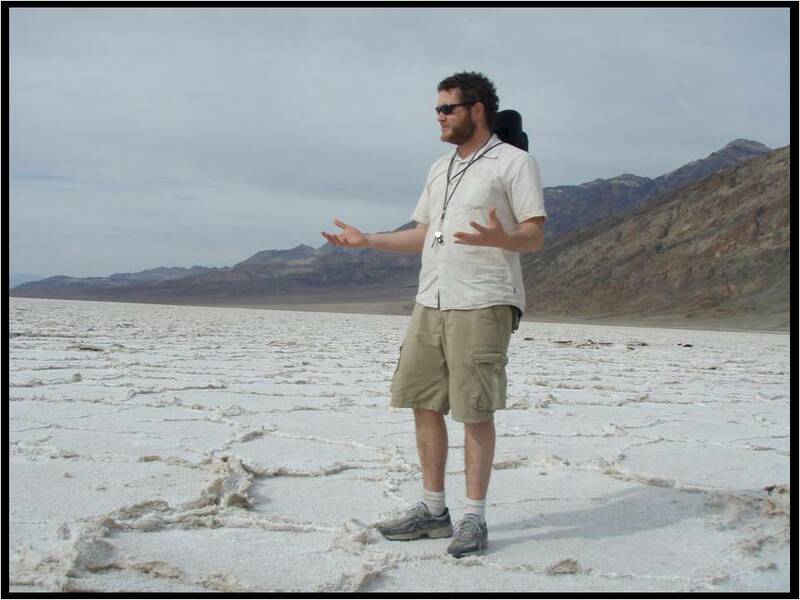 OSU GeoClub in Death Valley – Pictures! This is part one of a two part entry, come back next week to view part two. All photos can be clicked-on to view a larger version! 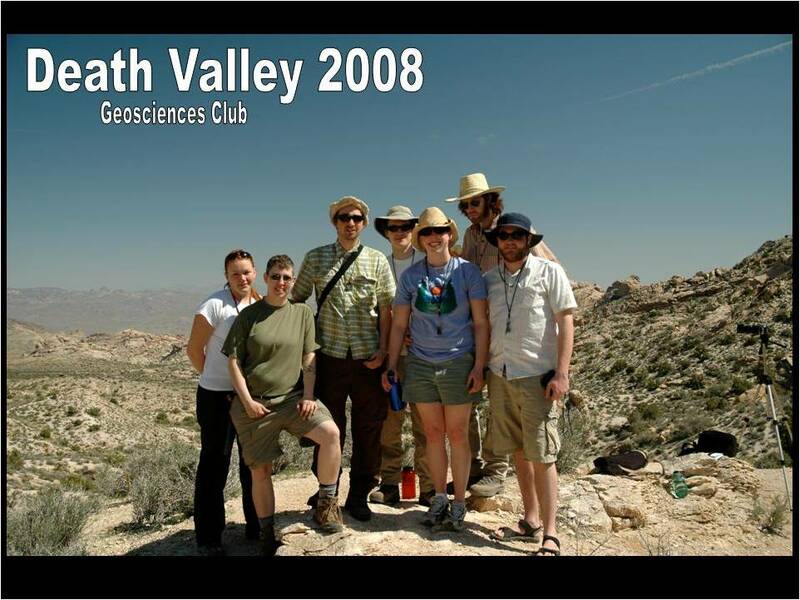 The club at the Spirit Mountain Batholith, a ~17-15 million year old granitic intrusion. Barry Walker got his masters degree studying this batholith at Vanderbilt University, and since the club was only ~2 hours away, they decided to stop by and have a look for a day. 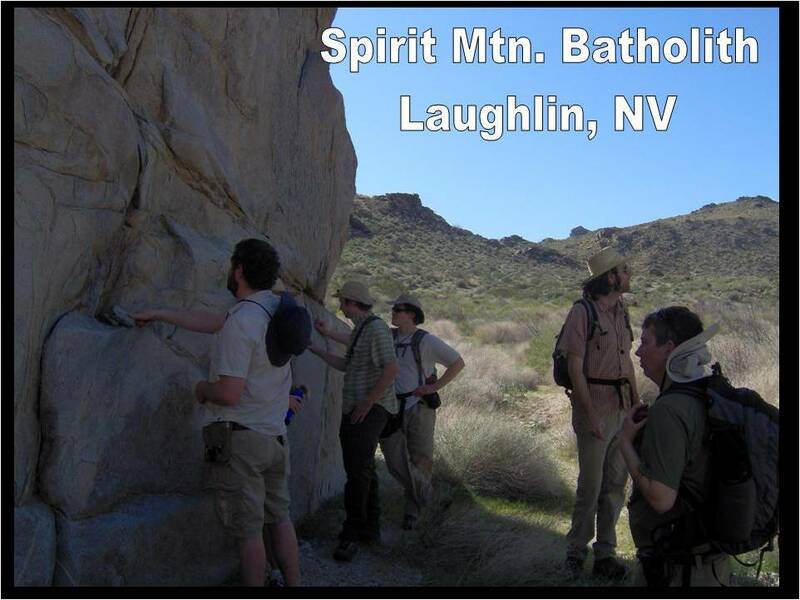 Here they are inspecting a large outcrop of granite at the Spirit Mountain Batholith while enjoying a spot of shade. The approach to Racetrack Playa, which is fairly isolated within Death Valley National Park. The group had to drive a little over an hour on a dusty gravel road to see this oddity. From afar, you can see that it looks like a typical stretch of desert sand. 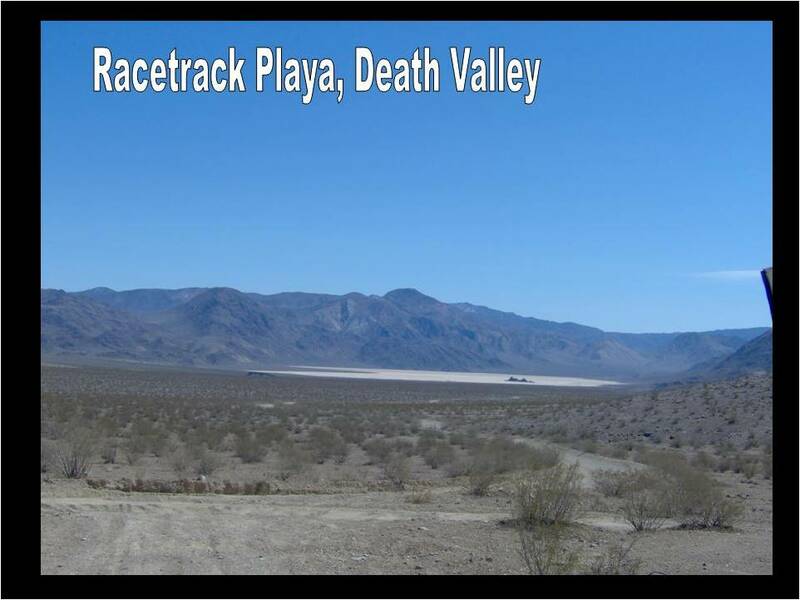 The black outcrop within the playa is called the Grandstand. 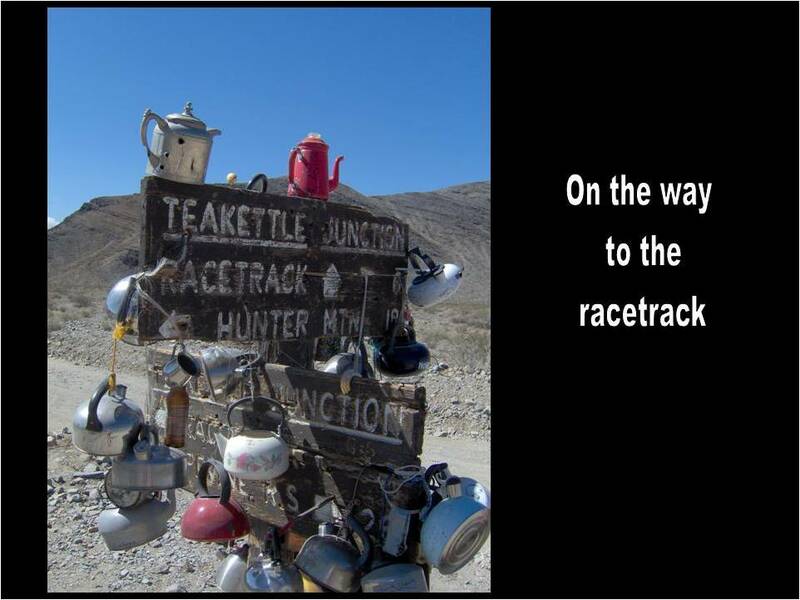 Teakettle Junction - desert weirdness! Of course, the group needed a photo of this. 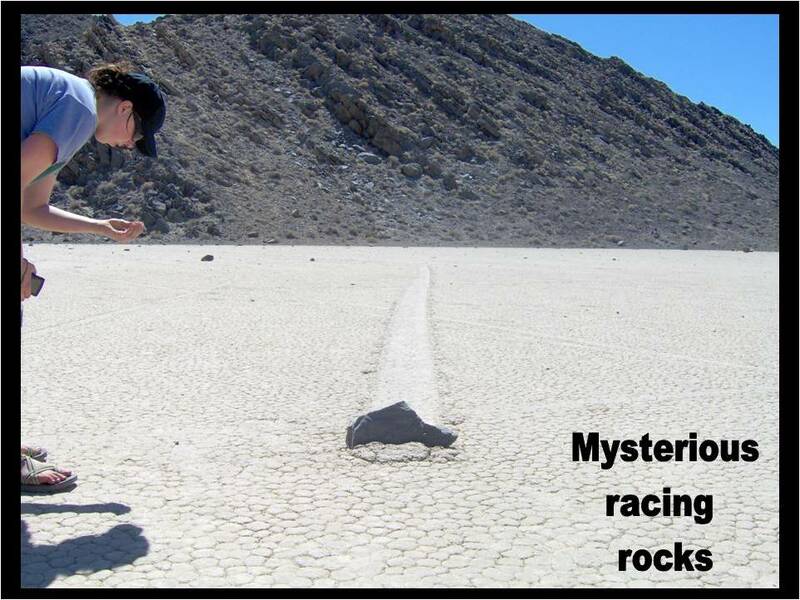 Racetrack Playa: This photo beautifully illustrates the process that has confounded geologists for years. The cliffs of tilted dolomite in the background have shed many rocks that fall down onto the playa floor. During intense rainstorms, these rocks slide across the playa aided either by wind and wet mud, a thin ice sheet or possibly both. Wind seems to be the favored mechanism at this point, but no one knows for sure because the action has never been observed. Note the dirt in front of the rock, which appears to have been scraped into a pile. 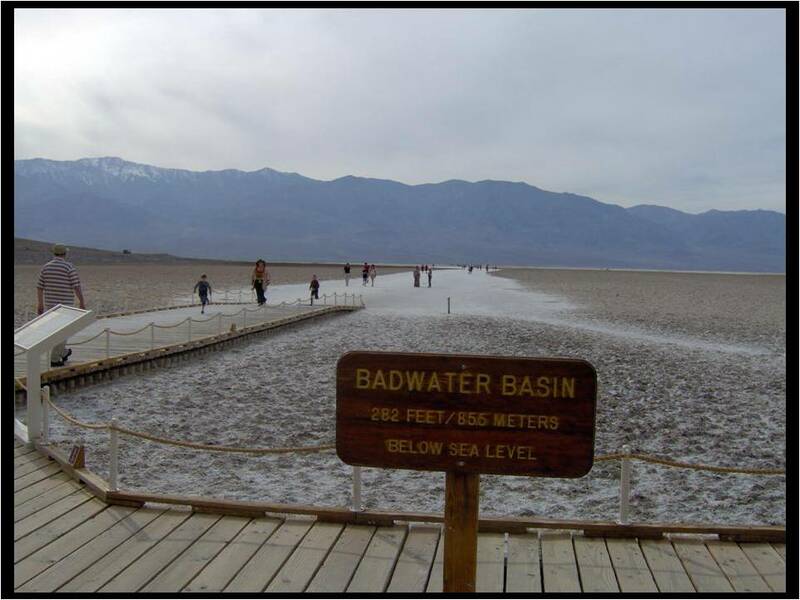 Badwater Basin is in the heart of Death Valley National Park and is at the lowest elevation in the western Hemisphere: 282 feet below sea level. It is called Badwater because there are some meager pools here that contain water that is spoiled by the dissolved salts from the playa. The Geo Club came here in late March and so experienced temperatures in the high 80s (with clouds for extra protection). In mid summer, though, temperatures can be over 130 degrees. Shortly after this, the group would find itself helping a family from Belgium change their rental van's tire. 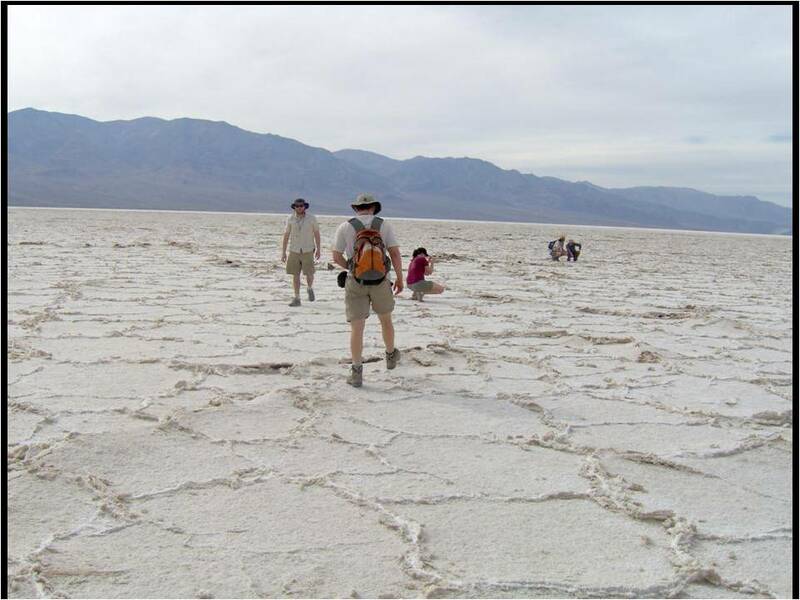 The club takes a stroll onto the playa at Badwater Basin. You can see that the desert floor is covered with a layer (several inches thick) of evaporaties (it was salty, so it's probably at least, in part, halite). Note that the evaporite crust has broken up in a mudcrack-like fashion. Stay tuned for more photos next week! OSU GeoClub in the Pyrenees – Pictures! To view this slideshow, click play, then click play again in the new window. 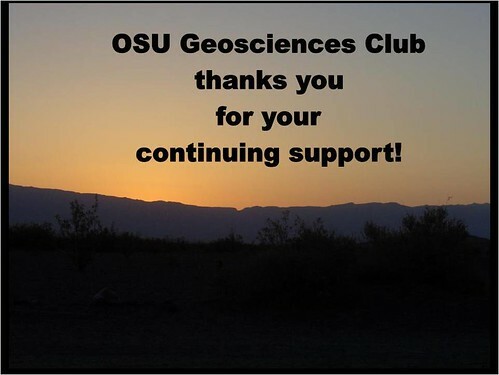 The GeoClub extends a big thank-you to everyone who made this trip possible!